I began Bring It Home in 2002 with the idea of creating a personal training company specializing in in-home training. When I started my career as a trainer, I realized that clients needed and wanted to be educated about kinesiology and physiology and how the body reacts to exercise and proper nutrition. I encountered well-meaning individuals going through the same routine and same exercises day after day but not gaining the full benefits of training. So I began to educate clients. I found that informed clients were more committed and motivated to achieving a healthy lifestyle. To me, it became clear that increased knowledge resulted in increased fitness levels. Bring It Home is not just about personal training. We believe we are educators. Our clients learn from us in order to improve their health and their well-being. Our training specialists will teach the importance of the 11 components of physical fitness and integrate these into all workouts to ensure training that is well-rounded. We combine our knowledge and expertise, with our clients’ commitment to training, so we, as a team, can maximize results. Our belief in “doing everything in moderation” includes diet and exercise. Training does not need to involve turning over tractor tires until you rupture a disc in your spine or kicking a heavy bag until your hips come out of joint or running 100 miles in a week until the cartilage in your knees is gone. These are extreme methods. There may be people who enjoy this and they may even be able to perform these activities. That’s great. But this extreme training is not only dangerous, in most cases, it is unncessary to reach optimal levels of fitness. Bring It Home teaches safe, effective, research-based training techniques that will help you achieve a higher level of fitness without a high risk of injury. Our personal training specialists will always instruct and demonstrate proper form and control on all exercises. This ensures that our clients know exactly how the body should be positioned and how movements are properly performed. At Bring It Home Personal Training, we know that keeping our clients strong and healthy and providing exercise at appropriate levels is the key to life-long health. If you are being discharged from cardiac rehab, physical therapy or struggle with diabetes, we will work with your doctors and physical therapists to ensure continuous professional care under close supervision. With your permission, we will contact your health care providers, discuss limitations, and create a comprehensive exercise program that will provide beneficial returns related to your medical condition. Your personal training sessions will be just that, personal. You will have your trainer’s undivided attention and strict attention to detail. We believe that safety always comes first when exercising. We will help you make educated choices about what you eat and how you exercise. Because knowing what works means you maximize every minute of your work-out, your day, and ulitmately, your life. Jeff Angel, owner of Bring It Home Personal Training, has always had an interest in fitness. His four years in the United States Marine Corps ignited a life-long passion for a disciplined approach to fitness and a healthy lifestyle. He became interested in the science behind effective work-outs and the impact of diet. This prompted Jeff to pursue a Bachelor of Science Degree in Health/Fitness in Preventative and Rehabilitative Programs and Nutrition from Central Michigan University. With this knowledge in hand, Jeff began work as a Personal Trainer at a health club. Before long, he realized that his unique approach to exercise and the individual needs of his clients could best be maximized and met through on-site training. And so, Bring It Home Personal Training was founded. For the past 14 years, Jeff’s unique approach to educating and motivating his clients has made him one of the most in-demand trainers in Oakland County, MI. The Bring It Home method of training has been refined and perfected and is now being taught to an expanding group of personal trainers. This has increased Jeff’s ability to deliver personalized fitness to the doorstep of his clients. 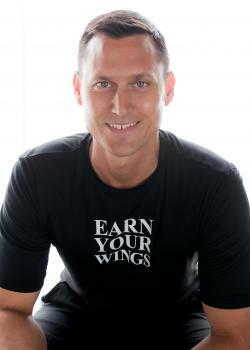 Jeff Angel’s commitment to inspire and educate is achieved through every client Bring It Home Personal Training serves. Jeff has appeared on Fox News, in the Detroit News and the Daily Tribune. He is proud to be a nationally certified personal trainer and sports nutritionist through the American Sports and Fitness Association. He is CPR/AED certified.